There are times when all we can do on ice is suffer our way to the top and there are times when we cannot stop smiling our way to the top. The later sums up day one on ice this season with Matt. We have roped up several times on ice and rock. 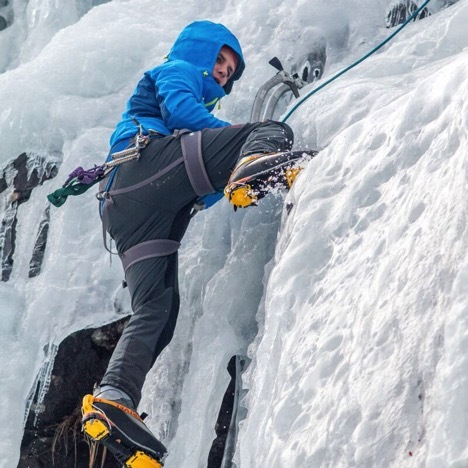 He has climbed ice and snow gullies on Katahdin as well, so he can relate to the wide spectrum of New England winter climbing conditions. We met photographer Mathias Deming at my place in North Conway for pre-dawn breakfast of steel-cut oats, egg scramble, bacon and coffee. It’s always been my prerogative to feed my guests a-la-Ryan Howes-cuisine. We made a solid plan over breakfast before driving to Pinkham Notch Visitor Center. With a decent weather forecast we made a swift departure with micro-spikes in hand, knowing the inevitable verglas-covered rock could be slow going. Within two hours we stood at the ravine’s floor staring at possible routes. I discussed our options while the sweat evaporated. We kept the inner fire going with hot tea and snacks. Then we suited up and made our way to the base of the “Headwall” to climb two multi-pitch ice and mixed lines that you can see behind me in the next photo. Matt and I did our best to tread lightly as we approached the Headwall. Early season conditions tend to have a limited snow pack. To gain the base of these ice climbs we tip-toed on stones, snow patches, running water and the occasional delicate alpine vegetation…sorry little guy. Matt was in stitches as I paid homage to the precious vegetation. In no time at all we made it to the base of our first climb. We dawned our micro-spikes for crampons, roped up, and I was off. Pitch one was a casual ice smear that made a hollow thunk sound every axe or crampon placement. This sound was a little disconcerting for Matt and probably more so for Mathias, who was capturing this environment for the first time. Reading the nature of ice requires time in the field. There is theory involved and facts to determine in this environment like, running water, ice color, shape, size and direction are a few things to consider. “It’s fine,” I said, as the lightest swing buried my axes into the buttery soft ice. Matt and I quickly climbed two pitches, using both ice screws and some rock gear for anchors. 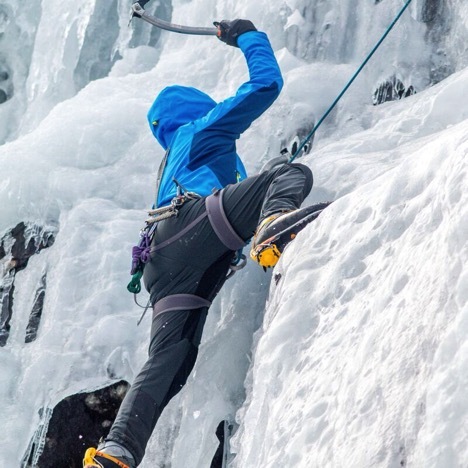 Early season climbing here is good practice for future climbs because the initial three-mile hike strengthens legs and cardiovascular system, while the climbing involves a variety of ice routes that requires a variety of protections skills and descending techniques. At the top of our first route, I lowered Matt to the top of pitch one’s anchor, where he clipped himself in using a personal anchoring system. After he completely untied himself, I pulled up his end of the rope and used a v-thread to rappel. Our transition took five-minutes. This was good team practice and effective use of skills. The next route was even better then the first due to steeper, more featured ice that brought us to a rock alcove with an old fixed piton anchor. Matt climbed to this point and chuckled after looking at the sad relic. He was grateful that we were attached to an anchor that I built with three bomber cams. After another quick transition, I was off to lead the final pitch with some fun mixed moves to gain a big ledge system. We shortened the distance of rope between us to approximately 40’ using a kiwi-coil. This allowed us to walk simultaneously on 4th class terrain while the terrain itself served as good protection between us. At one point I asked Matt to look at the terrain up ahead and find the best way through it. I told him that the path of least resistance is not necessarily the shortest distance from point A to point B, rather the less taxing path. With that said and a little conversation back and forth, we navigated some snow slopes, cutting switchbacks as we traversed to the top of a snow gully. I saw this gully while scanning the base of the Headwall, knowing that it would be an excellent descent choice that would incorporate some “alpine trickery” as some climbers call it. With some terrain and body belays, we down-climbed the gully and took one last look at the Headwall before heading back to Pinkham Notch.